From the Editor's Altar: All glories to BlackBerry! This site is more and more turning into some kind of religious sect. We have the worshipable objects in the forms of the Bold 9900, the PlayBook etc. on the altar. The teacher, guru or headpriest is Kevin, preaching the glories of Blackberry and RIM to his dedicated disciples, the regular readers of Crackberry.com! BlackBerry 10 is the Messiah coming to bless everybody and give them peace ond happiness but at the same time also to slay the demons in the form of iPhone and Android. I couldn't help but laugh and get a strong visualization after reading that, so here you have it in Doodle form! It's been a bad week for BlackBerry in the media, which has made for an insanely busy week on CrackBerry. The site has been buzzing with reactions on all of the news, and I've been finding it really interesting to read all of the comments from our readers. With a lot of people excited for BlackBerry 10 yet worried about the state of RIM's business, it's a big mix of cup half full vs. cup half empty. So let's talk about that. Keep reading to ... err.. drink from my cup. 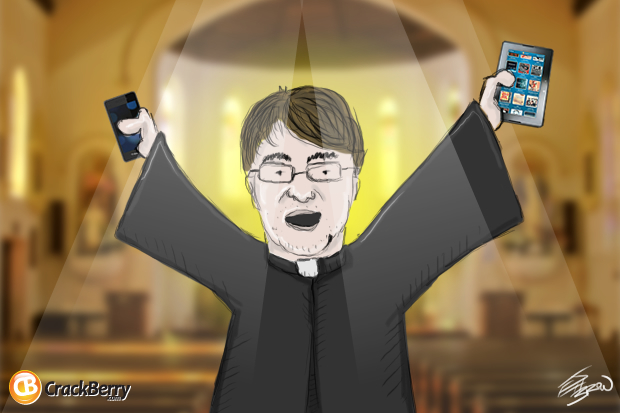 Now while thinking of CrackBerry Kevin as a BlackBerry "Preacher" is funny and somewhat true, the way I personally view myself is as a champion for BlackBerry. This is similar to how Phil is a champion for Android over at Android Central, Rene is a champion for Apple over at iMore, Dan is a champion for Windows Phone over at Windows Phone Central, and Derek... despite the state of webOS... is still a champion for that platform over at webOS Nation. The title for each of us may be Editor in Chief, but end of the day we all genuinely have our favorite platforms and we're all rooting for them to succeed. Put us all together on a round table Mobile Nations podcast and it can be pretty funny to watch our differently-placed passion collide. For many years BlackBerry was #1 in the Smartphone game, which made being a champion for the BlackBerry platform relatively easy. When you're leading in marketshare, the headlines are positive and the stock price is up, everything is working in your favor and it's easy to be enthusiastic. It's a different story for BlackBerry right now. They're losing marketshare, they're getting beat up in th media and on Wall Street, and with their next generation of devices still months away, things are going to start getting tight on the cash flow front, to the point where a lot of people "out there" are speculating something has to give. To say things are challenging right now for RIM would be an understatement. Logically, RIM's flip flop should mean it's difficult right now for me to be a BlackBerry champion. In reality, the opposite is true. I'm actually more of a champion for Research In Motion and BlackBerry than ever before. On the product side, I'm absolutely excited for BlackBerry 10. I'm obviously less enthusiastic with state of RIM's business following the update from CEO Thorsten Heins this week. But as Chris Umiastowski pointed out in a follow-up editorial, the majority of what we're seeing and hearing about RIM right now is a reflection of the past. Yes, RIM made mistakes. A lot of them. These mistakes were made when BlackBerry was still #1. These mistakes have put RIM in a tight spot. But being in that tight spot has forced RIM to change, and I think what will emerge is a better company and ultimately, better products. New management is fixing what was broken, providing clear focus. And the challenging situation RIM is in is bringing the fight out of the company. How do you get World Peace on Earth? According to Hollywood, you need aliens to invade and give mankind a reason to forget their differences and band together to fight a common enemy. How do you get a company to get its act together? You threaten its existence. Some will flee, some will unfortunately but necessarily need to be let go, but those who remain will unify and fight. RIM is fighting, Fighting, FIGHTING right now. Will RIM emerge victorious in their current battle and get BlackBerry 10 successfully to market? We took a poll on it this week, and 60% of CrackBerry Nation still has faith, 25% has its doubts and 15% don't know what to think. I cast my vote for YES. There are a LOT of BlackBerry People in the world, myself included, who need BlackBerry 10. Failure is not an option. Get it done #TEAMBLACKBERRY. In the meantime, #TEAMCRACKBERRY will keep the faith and continue championing for you, no matter how messy the fighting gets. We got your back.